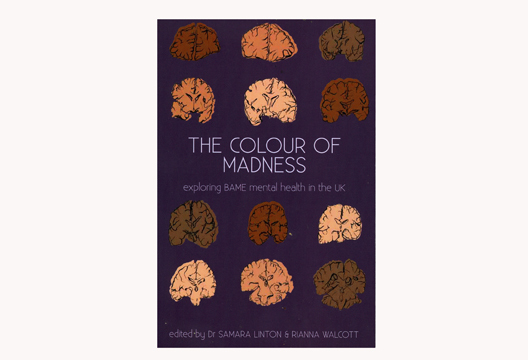 This is an edited anthology of essays, a research paper, poems and artwork from across the globe that creatively grounds experiences of mental illness in Black, Asian and Minority Ethnic (BAME) people. Employing a kaleidoscopic array, experiences are themed by colour (e.g. red, green, polychrome). Being more used to reading texts in this area with a strong academic tone, it was refreshing to read a book compiled almost as an ‘act of political resistance’, where contributors willingly invite the reader into their deeply personal accounts of living with, dying with, or having a family member with a mental illness. At times, the rationale for placing a piece within a colour choice was less clear (although explained by the authors in their conclusion); but the book is so engaging that, after a while, this was of less importance. Within are cultural accounts that range from bereavement from suicide to panic disorder. Poignancy for the prospect of imminent death from suicide is conveyed from the viewpoint of a slightly cracked open window into a sinking soul. Contributors eloquently capture the despair that accompanies admission to an eating disorders clinic, distress on separation from family, body-invisibility for life on a mental health ward, and effects for structural, systemic and institutional racism. Throughout these accounts, we are encouraged to make the shift from interested bystander to an ally for broken people. An overriding message in this book is the value that should be placed on protecting mental health to aid the process of healing. Psychologists or practitioners looking for the usual textbook approach to mental illness will not find it here. What you will encounter, however, are the cultural voices of broken minds that offer therapeutic insight into experiences of living with a mental illness. Our diverse, entangled world makes this collection well worth reading.